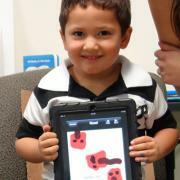 Kimberly’s budding journalists are a model for intentional, supportive use of technology in early childhood education. Kimberly’s learning environment is far richer than anything we could have imagined just 10 years ago, when the Fred Rogers Center for Early Learning and Children’s Media convened a group of experts (including us) at a preconference symposium during the 2007 NAEYC professional development institute. Participants discussed the role of technology in early childhood professional development and in the lives of young children, especially in early childhood programs. The question of equity loomed large as well. Many children whose home language was not English used television as a tool to learn English. For Black children from low-income families living in underresourced communities, television was often a heavily used source of entertainment. White children from middle-income families were more likely to have a variety of screens at home, while rural children typically had spotty access to the Internet. Early last October, my kindergartners were working hard to learn all about fall, though it was still too early to see many of the indicators of the season change here in central Texas. One marker of the season that my students were able to observe was butterfly migration. Swarms of butterflies were migrating through Texas, and we were lucky enough to walk under a cloud of monarchs on our way inside from recess. The NAEYC and Fred Rogers Center joint position statement was the first in a series of guidelines and research-based recommendations about technology and young children published by organizations focused on child development and early childhood education (Donohue 2016, 2017). The following resources summarize recent research, which reinforces central tenets of the NAEYC and Fred Rogers Center position statement. “Technology and Interactive Media for Young Children: A Whole Child Approach Connecting the Vision of Fred Rogers with Research and Practice.” 2017. Fred Rogers Center (www.fredrogerscenter.org/frctecreport) and the Technology in Early Childhood (TEC) Center at Erikson Institute (http://teccenter.erikson.edu/tec/tecfrcreport/). Two of the three most recent policy statements were released by the American Academy of Pediatrics (AAP) and the US Departments of Education and Health and Human Services (ED/DHHS) on the same day in October 2016. The AAP statement on “Media and Young Minds” includes recommendations for parents about technology and media use in the home with children from birth through age 8. According to the AAP, parents need to be mindful about the risks of displacing or replacing essential developmental experiences in the early years due to overuse of technology. Limits on media use for children birth to 18 months, 18 to 24 months, and 2 to 5 years can provide adequate time for young children to play and be physically active, to spend time indoors and outdoors, to have social time with friends, to enjoy one-to-one time with siblings and parents, and for family time without screen disruptions. Parents are encouraged to create a family media plan that includes tech-free zones and times, including no media use during meals and one hour before bedtime. The AAP emphasis on joint engagement, relationships with family and friends, preserving essential early childhood experiences, and careful selection of appropriate, high-quality content are closely aligned with the principles and guidelines in the NAEYC and Fred Rogers Center joint position statement. In this era of uncertainty around the role of technology with all of us, especially young children, I am deeply appreciative of the position statement for offering a thorough examination of the strengths and possibilities of technology as well as the possible misuses. Through this research, we have seen educators willing to try new things and open doors to new worlds for themselves and children. In regard to screen time, ED/DHHS ask that families and early educators consider far more than time when evaluating technology. The report points to content quality, context, and the extent to which technology could be used to enhance relationships as key factors. These guiding principles from AAP and ED/DHHS build on and deepen the key messages from the NAEYC and Fred Rogers joint position statement, adding to our understanding of emerging research-based practices. The fact that these two organizations are working together serves as an inspiration and reminder to others (teachers, parents, home visitors, therapists, children’s media producers, etc.) to work together and support each other as we learn to navigate the digital age. As the NAEYC and Fred Rogers Center joint position statement said, “When used wisely, technology and media can support learning and relationships. Enjoyable and engaging shared experiences that optimize the potential for children’s learning and development can support children’s relationships both with adults and their peers” (2012, 1). The new report by the Fred Rogers Center and the Technology in Early Childhood Center at Erikson Institute, “Technology and Interactive Media for Young Children: A Whole Child Approach Connecting the Vision of Fred Rogers with Research and Practice,” aims to say the same. It synthesized recent research to identify what has been learned about technology and young children since the joint position statement was released in 2012, with a focus on the intersection of technology, interactive and screen-based media, and children’s social and emotional development. It’s clear that we still have much to learn about the impact of technology on whole child development. Fortunately, one of the key findings in the report is that the majority of children’s use of technology or media includes imagining, playing, wondering, creating, and reflecting. This bolsters the notion that technology and media—when appropriately used—can improve children’s readiness for school and enhance their social and emotional development. Several mornings a week, preschoolers and toddlers scamper through the front door of the Homer Public Library with grown-ups—moms, dads, grandparents, neighbors, or nannies—in tow. Year-round, the centerpiece of these weekly visits for many families is Storytime, a free program that uses high-tech and low-tech media to foster lifelong learning and early literacy skills. The public library connects families from all walks of life with information and resources, as well as each other. At Storytime, we read, talk, play, sing, explore, and create together. Relationships—A child’s use of media and technology should invite and enhance interactions and strengthen relationships with peers, siblings, and parents. Coviewing and active parent engagement—Using media together improves learning. Talking about what the child is seeing and doing, and connecting what is on the screen with real-life experiences, builds language skills and vocabulary, encourages interactions, and strengthens relationships. Social and emotional learning—Technology should be used in ways that support positive social interactions, mindfulness, creativity, and a sense of initiative. Early childhood essentials—Technology use should not displace or replace imaginative play, outdoor play and nature, creativity, curiosity and wonder, solitary and shared experiences, or using tools for inquiry, problem solving, and exploring the world. Content, context, and quality—The quality of what children watch on screens is more important than how much they watch. Media creation—Young children are moving from being media consumers to media creators. New digital tools provide the opportunity for making and creating at their fingertips. Family engagement—In the digital age, technology tools can improve communication between home and school, making it easier to exchange information and share resources. Engaging families improves outcomes for children. Adult habits—As the primary role models for technology and media use, adults should be aware of and set limits on their own technology and media use when children are present and focus on children having well-rounded experiences, including moderate, healthy media use. Teacher preparation—Preservice teacher education and in-service professional development are needed to provide educators with the media literacy and technology skills to select, use, integrate, and evaluate technology tools for young children. Media mentors—Young children need trusted adults who are active media mentors to guide them safely in the digital age. 1. Create a sense of worth? 2. Create a sense of trust? 4. Have the capacity to foster you to look and listen carefully? 5. Encourage the capacity to play? 6. Allow for moments of solitude? As we develop initiatives around this concept, we look forward to continuing to champion the principles and guidelines from the position statement and working with our partners to implement a strategy that is based on positive and supportive messaging. Although the consensus takeaways show that much progress has been made since the debates of a decade ago, there is still much to learn. We invite you to join us in building on our growing understanding of what matters most and of evidence-based practices. We believe that blending interactive technology and personal interactions with others offers the most promise for using technology as a tool for whole child development in the digital age. Fred Rogers demonstrated how to use the technology of his day to support early learning with an emphasis on relationships, communication, and social and emotional development. He was a child development expert who always kept the child first and integrated technology in the service of positive self-esteem and healthy relationships. As Fred Rogers said, “No matter how helpful they are as tools (and, of course, they can be very helpful tools), computers don’t begin to compare in significance to the teacher–child relationship, which is human and mutual. A computer can help you to learn to spell H-U-G, but it can never know the risk or the joy of actually giving or receiving one” (Rogers 1994, 89). Fred was a media mentor to countless children, parents, families, and caregivers—and his approach will continue to guide our work. Five years ago, NAEYC and the Fred Rogers Center took a bold step in laying out a vision for the critical role technology can play in early learning programs. While the position statement was clearly about technology, it wasn’t about which apps to use or how to unlock digital coding. It was directed at early childhood educators and what they, as classroom and program leaders, must know and be able to do in order to effectively use technology. Five years later, that is still the most important aspect of our work with technology. Neuroscience and behavioral science point to unparalleled cognitive, physical, and social and emotional growth in young children. These sciences have also shown us that our lifelong approaches to learning—things like initiative, curiosity, motivation, engagement, problem solving, and self-regulation—are at their height of development in the early years. Early childhood educators must redouble their efforts to identify and deploy the most effective uses of technology in order to maximize the learning and development of young children. Think about the acquisition of oral language, the developmental progression of mathematics, the growth of self-regulation and inhibitory control, the mechanics of working memory, and the facilitation of relationships with children and their families—early childhood educators must master a great deal of knowledge and skill in each of these areas. There are many ways effective uses of technology and digital media can support early childhood educators in preparing young children for success in school and in life. To read more stories and testimonials and view photos of the NAEYC/Fred Rogers Center joint position statement in practice, visit the Technology in Early Childhood (TEC) Center at Erikson Institute: http://teccenter.erikson.edu/tec/positionstatement5/. Copple, C., & S. Bredekamp, eds. 2009. Developmentally Appropriate Practice in Early Childhood Programs Serving Children from Birth through Age 8. 3rd ed. Washington, DC: National Association for the Education of Young Children (NAEYC). Donohue, C., ed. 2015. Technology and Digital Media in the Early Years: Tools for Teaching and Learning. New York: Routledge; Washington, DC: NAEYC. Donohue, C. 2016. “Technology in Early Childhood Education.” In The SAGE Encyclopedia of Contemporary Early Childhood Education, vol. 3, eds. D. Couchenour & J.K. Chrisman, 1344–48. Thousand Oaks, CA: Sage. Donohue, C. 2017. “Putting the ‘T’ in STEM for the Youngest Learners: How Caregivers Can Support Parents in the Digital Age.” ZERO TO THREE, 37 (5): 45–52. Donohue, C., & R. Schomburg. 2015. “Preparing Early Childhood Educators for the Digital Age.” In Technology and Digital Media in the Early Years: Tools for Teaching and Learning, ed. C. Donohue, 36–53. New York: Routledge; Washington, DC: NAEYC. NAEYC & Fred Rogers Center for Early Learning and Children’s Media. 2012. “Technology and Interactive Media as Tools in Early Childhood Programs Serving Children from Birth through Age 8.” Joint position statement. Washington, DC: NAEYC; Latrobe, PA: Fred Rogers Center at St. Vincent College. www.naeyc.org/content/technology-and-young-children. Rogers, F. 1994. You Are Special: Words of Wisdom from America’s Most Beloved Neighbor. New York: Penguin. Chip Donohue, PhD, is dean of distance learning and continuing education and director of the TEC Center at Erikson Institute and Senior Fellow and advisor of the Fred Rogers Center for Early Learning and Children’s Media at Saint Vincent College, in Latrobe, Pennsylvania. Donohue and Roberta Schomburg cochaired the working group that revised the 2012 NAEYC & Fred Rogers Center Joint Position Statement on Technology and Interactive Media as Tools in Early Childhood Programs Serving Children from Birth through Age 8. Roberta Schomburg, PhD, is professor emerita at Carlow University in Pittsburgh, Pennsylvania; senior fellow at the Fred Rogers Center for Early Learning and Children’s Media, and a consultant to the Fred Rogers Company and Daniel Tiger’s Neighborhood. She was an NAEYC Governing Board member from 2010–2014.